Rotunda Gallery, City Hall, 280 Grove Street, Jersey City, NJ. 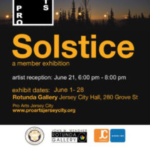 Pro Arts Jersey City announces “Solstice”, a member exhibition which will be on view from June 1 thru June 28, 2017 at Rotunda Gallery, 3rd Floor, City Hall, Jersey City located at 280 Grove Street. The exhibition has been presented by Mayor Steven M. Fulop, The Jersey City Municipal Council, the Office of Cultural Affairs and Pro Arts Jersey City. Humans have long celebrated the astronomical occurrence of the longest daylight of the year, also known as midsummer, in the northern Hemisphere. It is the point when the sun seems to stand still in the sky. While the Northern Hemisphere celebrates the longest day of the year, those south of the equator are experiencing the shortest day, or winter solstice. In the Arctic, it is the time of the midnight sun. Celebrations surrounding the summer solstice have been held since ancient times. In ancient Chinese culture a ceremony was held to honor the earth, femininity and yin; the Sioux held spectacular rituals featuring dancing and body paint; Pre-Columbian civilization placed great significance on the solstice, positioning temples so that the buildings aligned with cast shadows at important astronomical times, and the Romans paid tribute on the solstice to Vesta, goddess of the hearth. fire, dancing, maypoles and sun salutations are some of the ways that people still celebrate the solstice. This month-long exhibition celebrating Solstice showcases the artworks of over 30 artist members sharing their diverse interpretations of the theme. Featured Artists : Alan Walker, Alpana Mittal, Angela Costanzo Paris, Anthony Boone, Carla Cubit, Christy O’Connor, Daryl-Ann Saunders, Deirdre Kennedy, Eileen Ferara, Ekaterina Abramova, Francesca Azzara, Greg Letson, Hao Feng, Ibou Ndoye, Jean-Paul Picard, Jim Fischer, JoanMarie Palmer, Linda Streicher, Lisa Collodoro, Luis Alves, Michael Endy, Mollie Thonneson, Nupur Nishith, Robyn Prezioso, Sandra De Sando, Susan Carolonza Chanin, Tharanga Goonetilleke, Theda Sandiford, Tim Daly, Trix Rosen, William Stamos. The Exhibition is free and open to the public during weekly hours. The exhibition venue is generously offered by City Hall Jersey City. Artist Reception: Wednesday, June 21, 2017, 6:00-8:00pm. The exhibition will also be on view for JC Fridays on Friday, June 2, 2017, 6:00-8:00 pm.